The treacherous Lieutenant of the Decepticons, Starscream soars the ranks in Premium Scale. Using his guile and cunning tactics, Starscream slyly seeks any opportunity to overthrow Megatron and take his place as leader of the Decepticons. 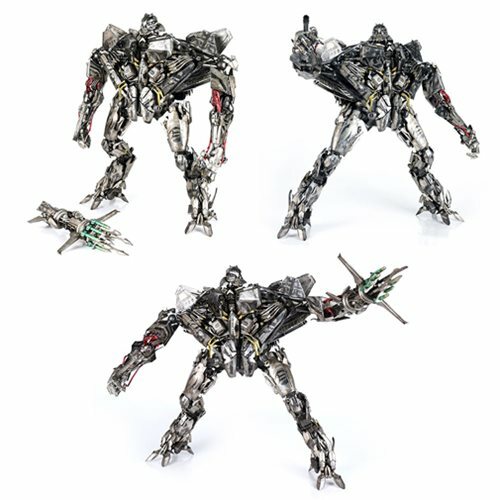 Standing at about 16-inches tall, the Transformers Movie Starscream Premium Scale Edition action figure features an extremely detailed sculpt and paint applications including Cybertronian Tattoos. Starscream is fully poseable with over 75 Points of articulation including articulated fingers. The highly-detailed sculpt and paint application features a realistic weathering effect. Comes with additional interchangeable missile cluster arm, and LED light-up eyes. Made of ABS, PVC, and POM plastics and requires 2x "AG13" button cell batteries, not included. Ages 15 and up.